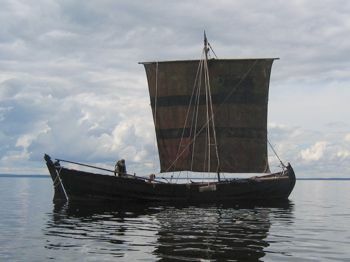 I had sailed on Helena once before, on a weekend trip in the Turku archipelago. But crossing the Atlantic would be a more interesting adventure. 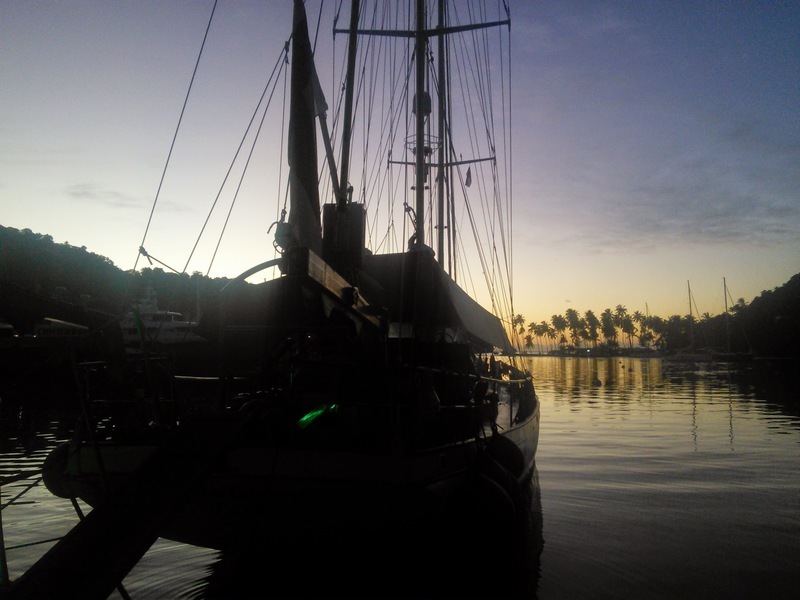 For a month this two-masted tall ship would be our home on the ocean. Arriving to the harbour, Helena was easy to find moored next to a Czech “pirate ship”. 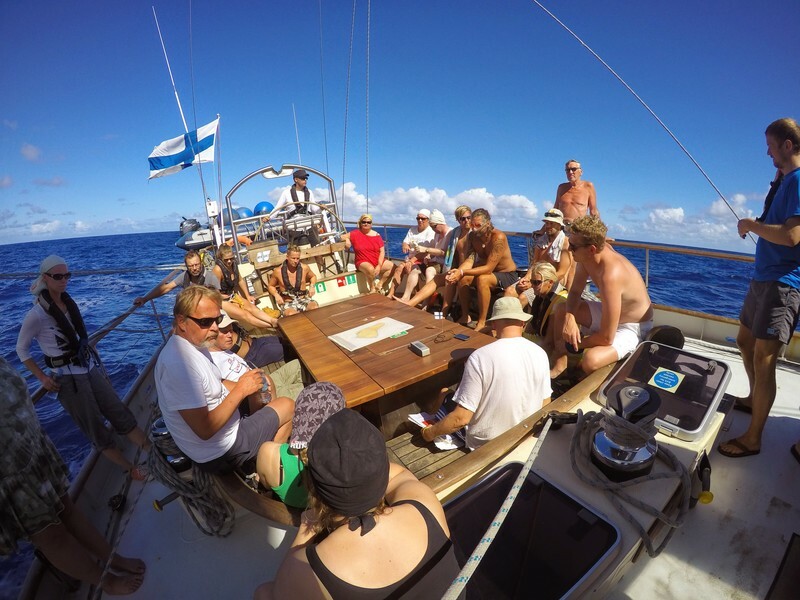 We registered with the captain and got assigned to the first watch, and then went out for a dinner dinner and some wine with some friends from Berlin who happened to be holidaying on the island. 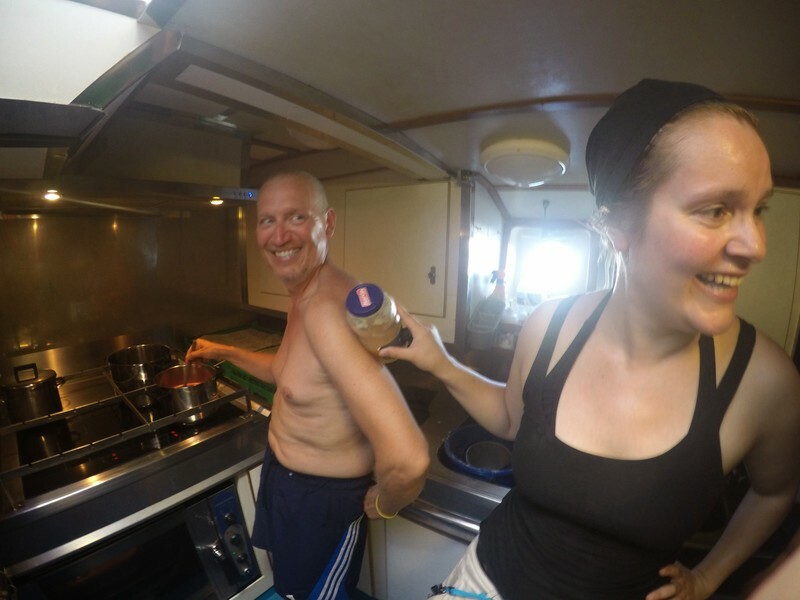 The next day was busy with provisioning the ship and getting to know the rest of the crew. Every possible nook and cranny would be filled with fruits, fresh produce, water, and other things needed on the long trip. The ship’s electricity system also needed some repairs, causing delays with the departure. But at the last moment to catch the high tide, on the evening of November 24th, Helena sounded the three long blasts on the foghorn and we were on the way! 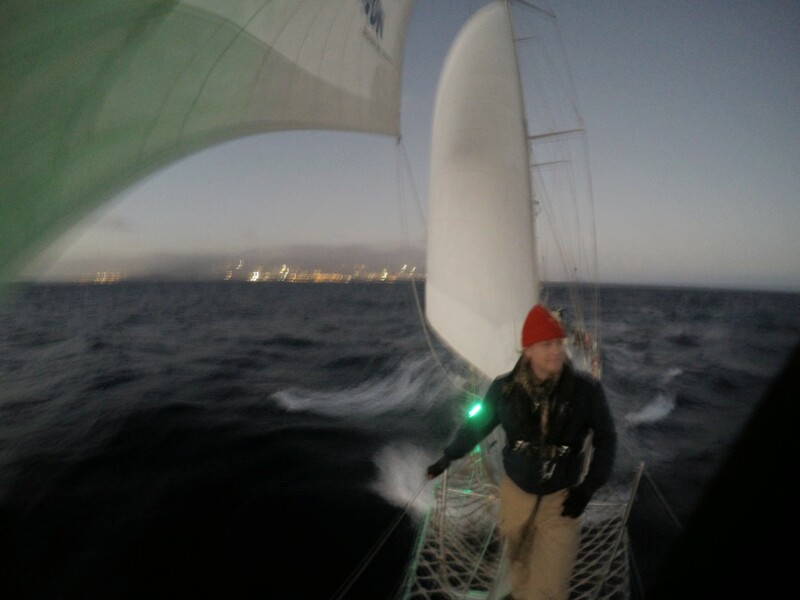 Almost immediately after leaving port, we encountered the larger waves of the ocean. This caused some discomfort for many of our students. Our first watch was on kitchen duty, and there were several moments where there was a need to get out of the fumes and out in the fresh air to get one’s bearings. But human beings being as adaptable as they are, by the next day any signs of seasickness would be gone from pretty much everybody, and the whole group could enjoy the adventure ahead. Built in 1992, the steel hulled schooner T/S Helena is the main training ship of the Finnish Sail Training Association. Displacing 110 tons and with length of 38 meters, it is not a small sailboat. 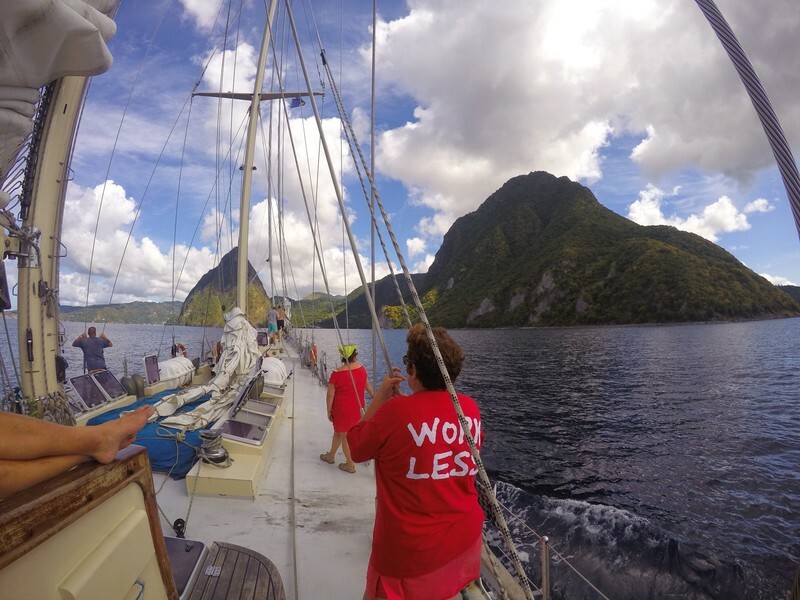 It has a capacity of accommodating 28 crew members and students, as has undertaken many epic adventures on its journey. Cape Horn following the trail of frigate Suomen Joutsen, north to Svalbard, and many many Atlantic crossings. Inside the ship we’d have cabins for each of the four watches, and a separate area for the professional crew. Also, several restrooms, a shower room, and a kitchen and lounging area. While the primary means of moving the ship is by sail, it is also outfitted with a powerful engine, as well as an auxiliary power unit for producing electricity and making drinking water. 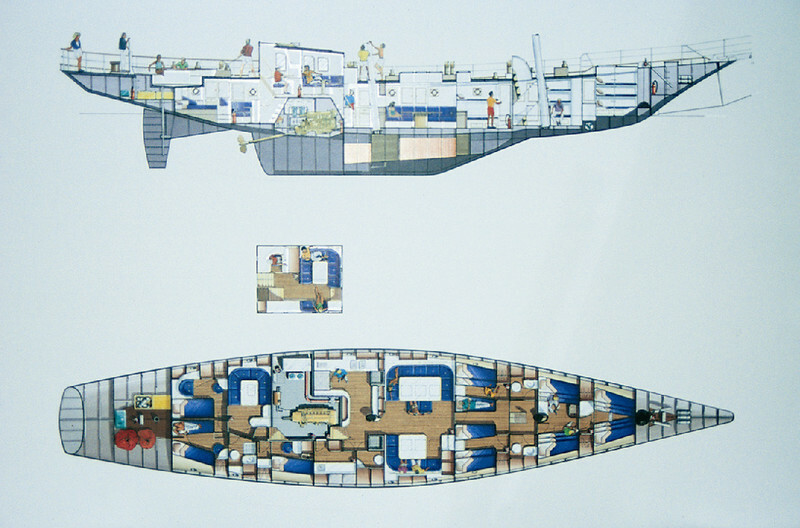 While underway, the life on board of Helena is dominated by the traditional naval watch system, where the crew is divided into four watches, each with their own cabin. 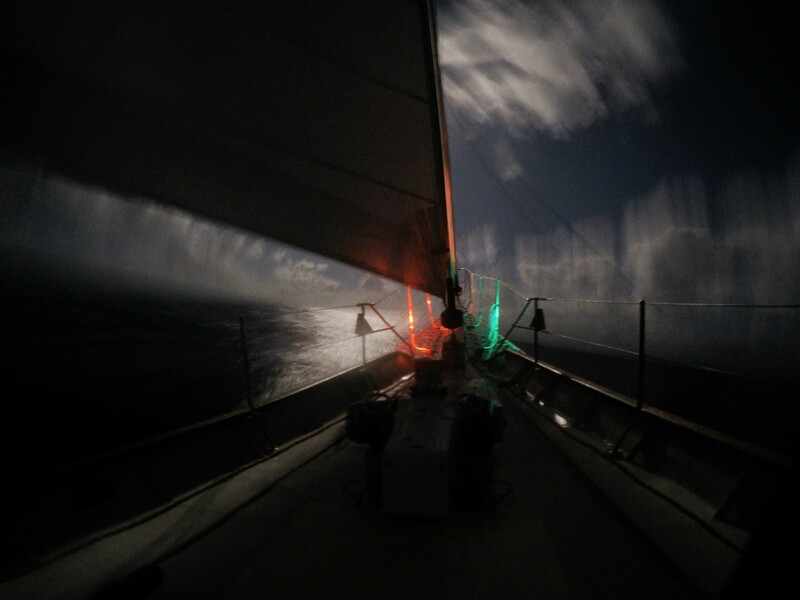 The watch on deck duty handles all the sailing tasks of steering the ship, adding or removing sails, as well as navigation and monitoring the radio and AIS. The watch on standby makes and serves the meals, as well as keeping the ship clean. When on free watch there is time to sleep, read, and relax on the deck. 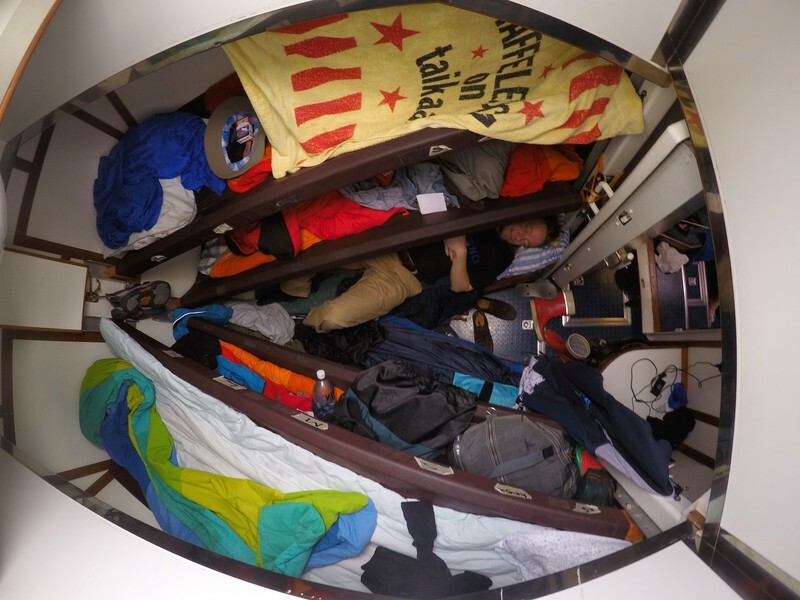 The cabins are quite a tight fit, and so on the nice warm tropical nights many preferred to sleep inside the sail stash on the deck. Alongside the normal duties there were lessons on sailing theory, navigation, safety equipment, knots, and other matters. Various students had also been tasked with giving lectures on the islands of Cape Verde and Barbados where we were stopping, as well as on marine life. 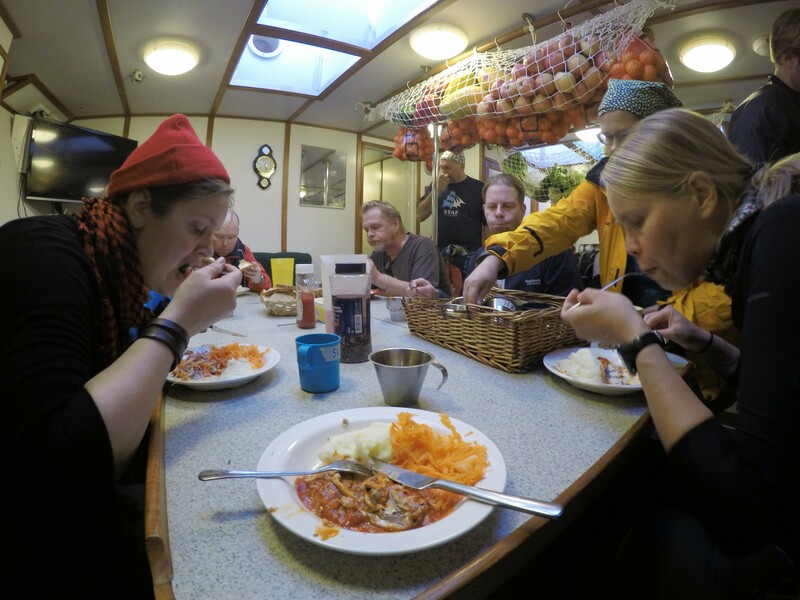 The three warm meals of the day were obviously a highlight, with the crews ending up in friendly competition on what kind of epic meals could be made of the supplies. And this being a Finnish institution, on Thursday the lunch is always pea soup and pancakes. As always, when food is good, everything goes smoother. The last cooking shift of my First Watch ended on a high note, when we prepared rum-marinated swordfish with garlic mashed potatoes. Along the way provisions would of course dwindle, and once all fresh fruit and bread had been consumed, the kitchen shift would also start to include baking bread. 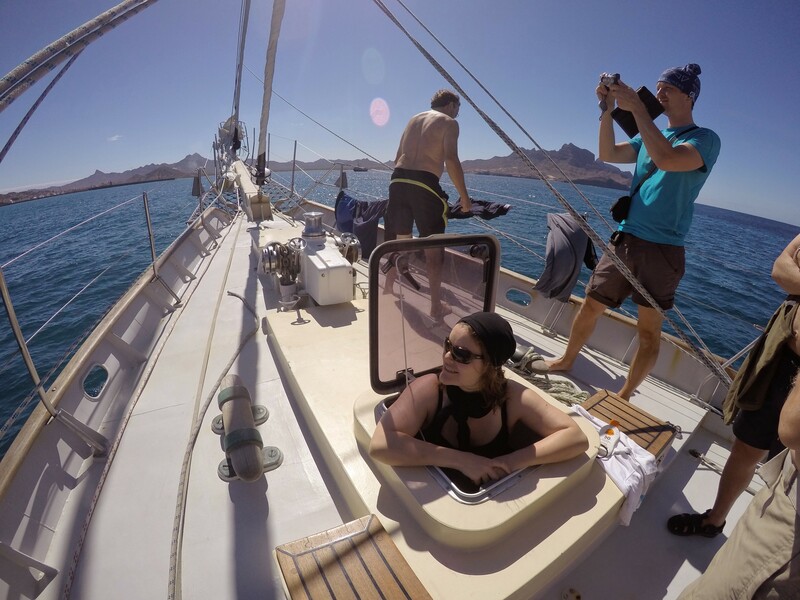 While the space is tight on the ship, and you’re rubbing elbows with other crew members pretty much everywhere onboard, there are still some places that are more secluded and fitting for relaxation. 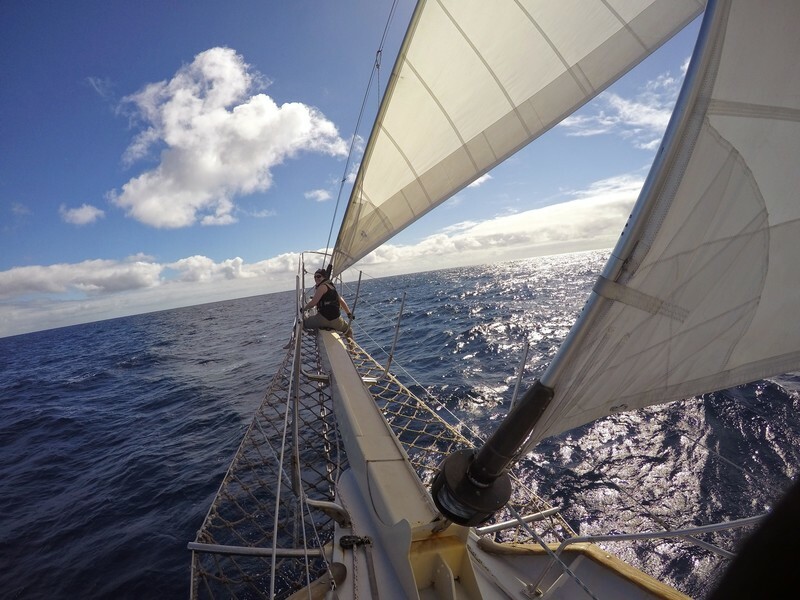 Especially the bowsprit has proven to be a place where one can focus on meditation and the open ocean. One thing that I didn’t consider before the trip is how sticky everything would be through the constant presence of sea salt and sweat. The cabins were hot, and since there were issues with the water maker, we had to wash ourselves and do laundry with sea water. 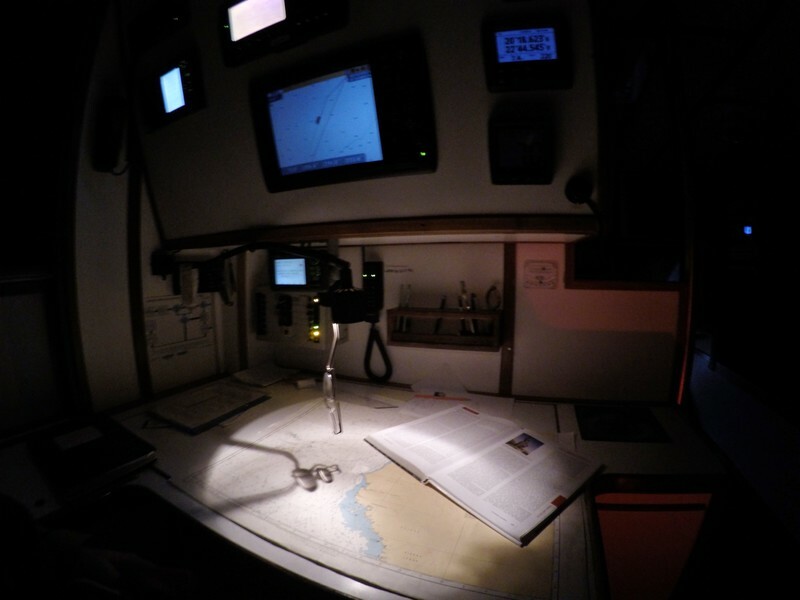 One of the most memorable parts of the trip were the nights when our watch was on deck duty. 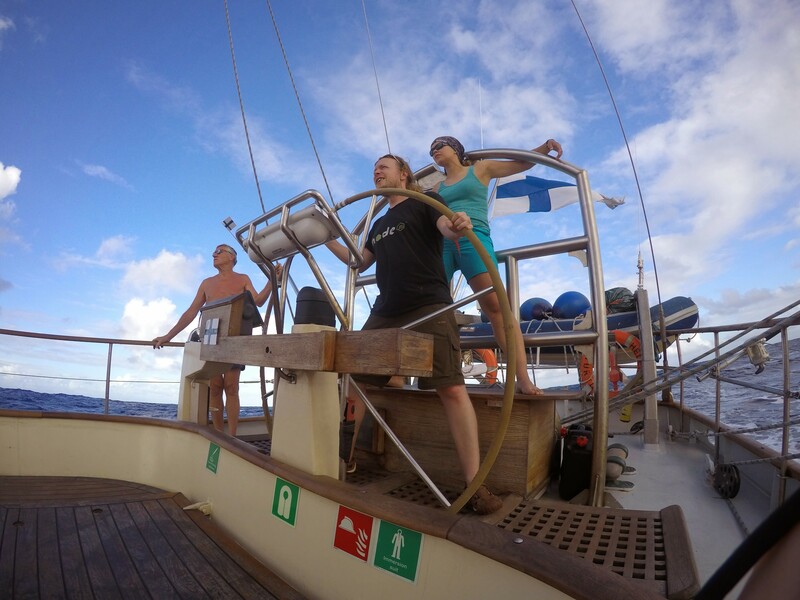 Steering the big ship by stars, just like ancient Phoenicians. Or when somebody else was manning the wheel just enjoying the constant shooting stars of the Geminid meteor shower, the play of moonlight on the sails and the sea, and even an occasional dolphin jumping by the ship, lit with phytoplankton. 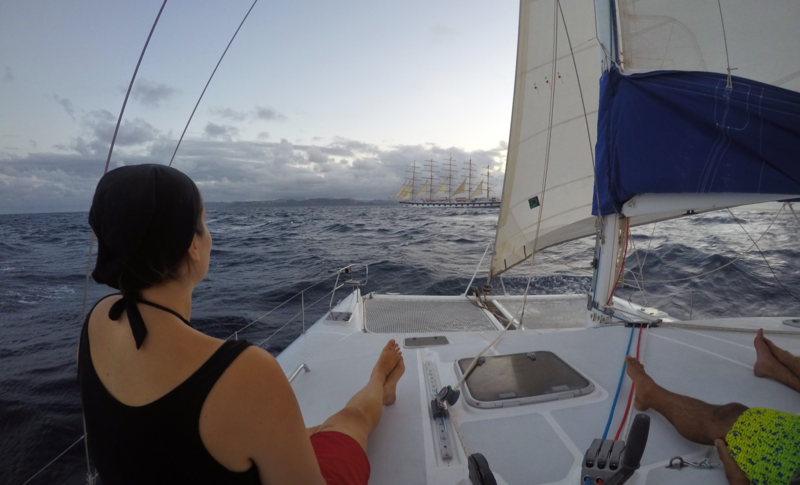 Starting from Tenerife, we followed the traditional Age of Sail route along the coast of Africa to the Cape Verde islands, where we stopped for some provisions and recreation in the sleepy town of Mindelo. After Cape Verde we headed west across the ocean, setting out sights for the island of Barbados. 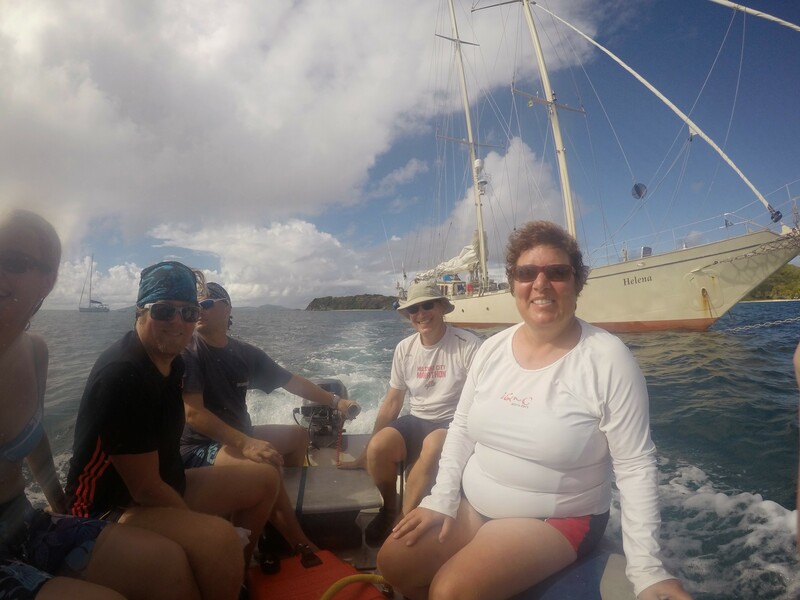 After some sightseeing and sail repairs, the route continued past the Sail Rock to the Tobago Cays marine park, where we stopped to enjoy a very nice lobster dinner on the beach. 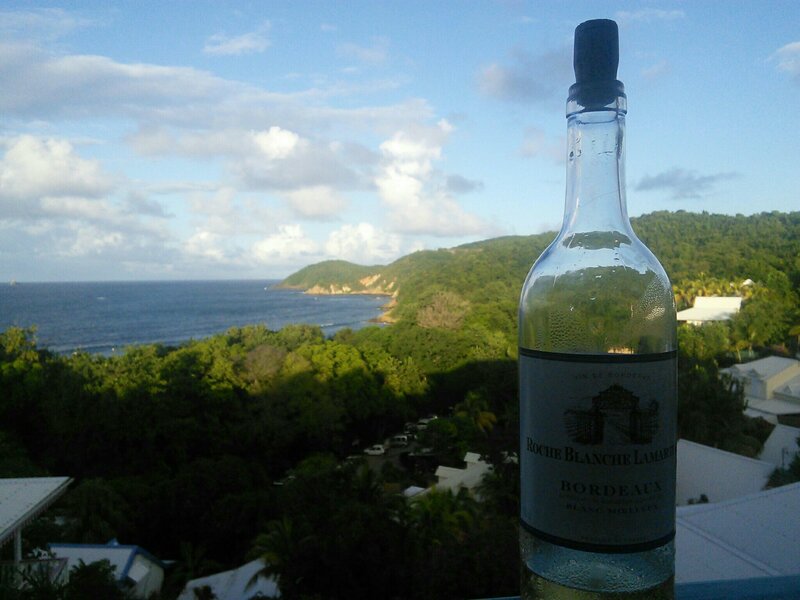 Then the trip continued northwards to St. Lucia, stopping in Marigot Bay for a farewell dinner. Our final port of call was Le Marin on the French colony of Martinique. 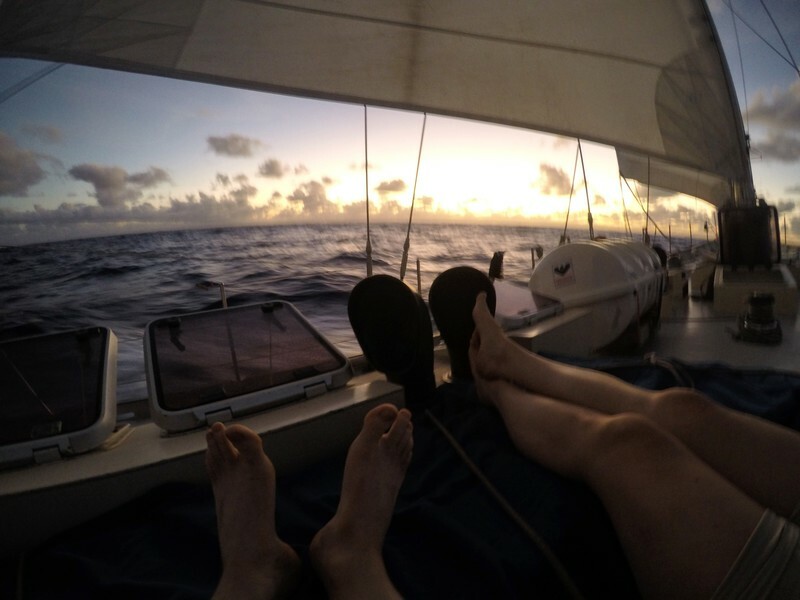 So, in a way we did a very long sailing trip to get from Spain to France! A traditional “crossing of the Atlantic” ceremony was held and then it was time to leave the ship and return to being a pedestrian traveler. It didn’t feel sensible to fly home directly, and so we decided to spend the Christmas on Martinique. This ended up being a very relaxed few days with nice cheese and wine and a candlelit balcony, as the power went out from the part of the island where we were on. Since our flights were from St. Lucia, we ended up finding an Australian catamaran that we were able to commission to take us across. 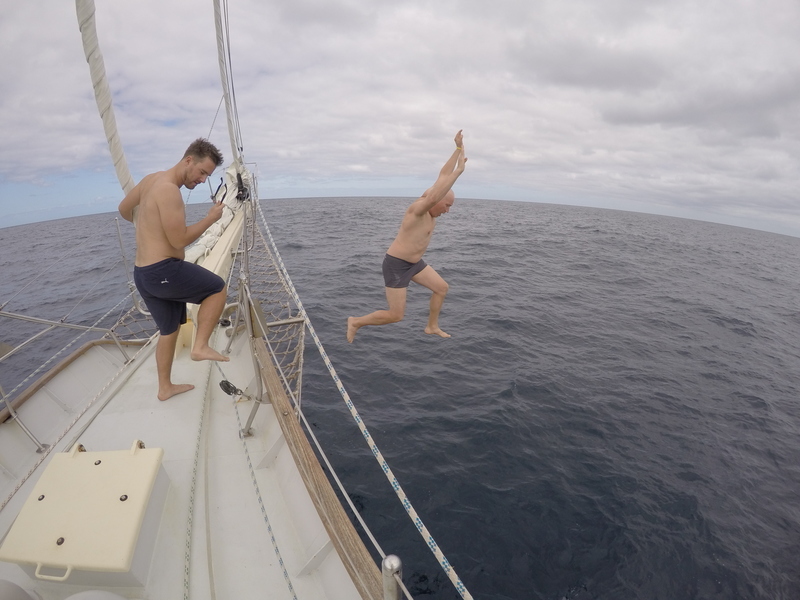 After the strict routines of a sail training vessel, it was quite a culture shock to get on a recreational sailboat. We still got our last glimpse of Helena on the trip by accident. 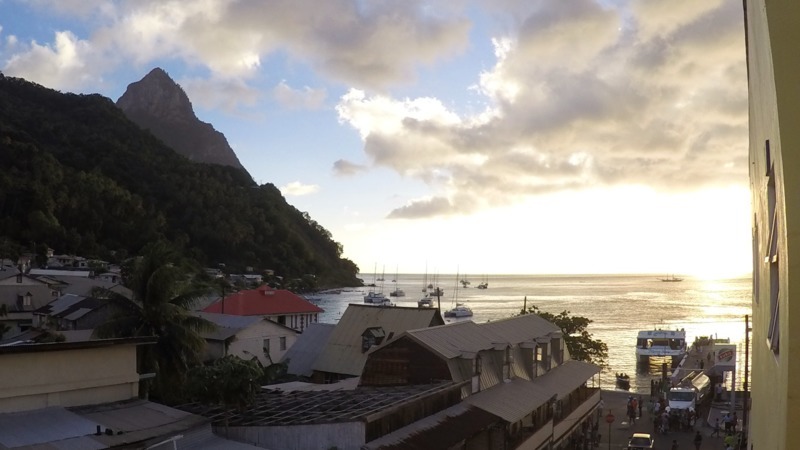 As we were watching the sun set behind the Piton mountains from our hotel balcony in Soufriere, the ship glid majestically across the bay, getting ready to anchor somewhere outside of the marina. But that was another crew, embarking on an adventure of their own. For us it was time to fly home and prepare for another hectic Grid meetup in Hawaii.